A recent article in JAMA raises the question: should physicians be screened for mental health conditions such as depression or burnout? We asked our HCP members of Univadis to weigh in on the topic. 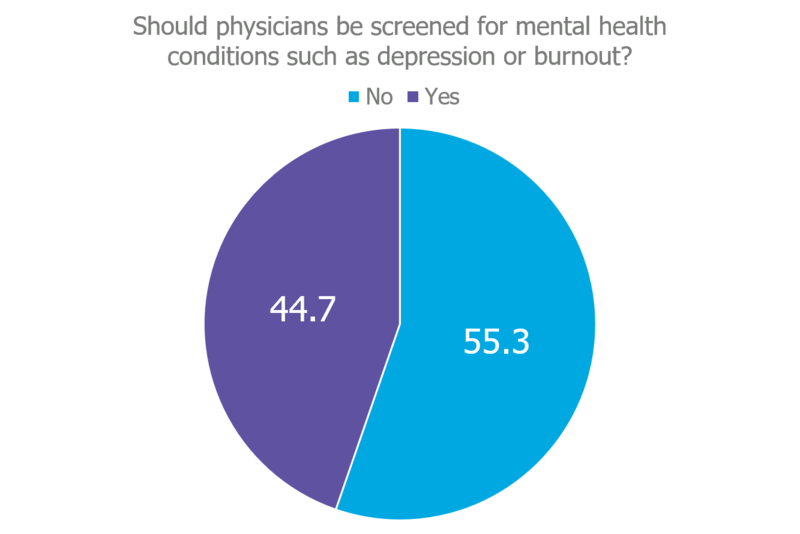 More than 1000 responded to the poll, with a slight majority (55.3%) saying clinicians should not undergo regular mental health screening, while 44.7% said they should. Hundreds also left comments addressing both the positive implications of such screenings (such as identifying clinicians at risk and connecting them with treatment), and the downsides, including potential threat to confidentiality and licensure; liability, and the likelihood of false-positives. "Enough mandates! Physicians already have way too many people outside of medicine telling them what to do, how and when to do it, etc." "Healthcare managers with big paychecks should have mental health screening!" "Despite the concept of helping physicians, this would quickly turn into a tool used by medical boards or administrators to force physicians out of practice." "Why not mandate a workplace where depression, burnout, and suicide isn't common?" "I think that it is a good idea for physicians to have mandatory mental health assessments so long as confidentiality can be assured and that the results of such studies have no negative consequences vis à vis medical board status, etc." "We all get regular screening on the health of our bodies, but are resistant to have mental screening performed...fighting mental health screening makes no sense to me!" "Clinicians are human as are others...their behavior in the mental health area is the best modeling for appropriate, positive mental health maintenance and care." "It sure would have helped to prevent my burnout!" More than just giving HCPs a place to share their attitudes on topics like this, Univadis also provides a wide range of expert-led educational content aimed at helping address issues like physician mental health, suicide, stress, burnout and more. It’s just one more example of the kind of value Univadis offers HCPs as part of their daily practice.